Our first Friends of Guild Park & Gardens Newsletter brings you up to date on what’s been happening and what’s coming up regarding the Guild Park. To everyone who’s joined as a Charter Member of The Friends of Guild Park & Gardens, thank you for your commitment and involvement. With your membership you have demonstrated your vision and determination. To those of you who’ve expressed interest in the Friends and want to stay informed on our activities, thank you for your interest. Whether you already a Friends member or a supporter, we hope to meet you at one of the upcoming events you’ll read about below. We also want to extend our heartfelt appreciation to our partners in the community; the Guildwood Village Community Association and the Guild Renaissance Group and Councilor Paul Ainslie and his dedicated office staff. We’re thrilled to be working collaboratively with these groups towards improving and revitalizing Guild Park & Gardens. By adding value to Guild Park, we’ll also be adding value to our immediate community, our city and our country. This summer we resumed our popular Walking Tours of The Guild Park. In May, our team of volunteers welcomed more than 500 visitors from across the city for Doors Open Toronto. In July, another 100 visitors came to Guild Park for a walking tour done as part of Heritage Toronto’s Summer Tour Series. Throughout August, and before many of the outdoor performances by the Guild Festival Theatre, we also gave evening tours of Guild Park. Since starting these tours in July 2012, more than 1,000 people have come to Guild Park and learned about the nature, art and people connected with this site. About half of the tour visitors live outside the Guildwood/Scarborough area and for many, the tours mark their first ever visit to Guild Park. Want to help us welcome more visitors on future Guild tours? We’re seeking volunteers to be involved in next year’s tours. The only necessity is having a strong personal interest in people and in the Guild’s history and future. It’s a great opportunity for students, seniors and others keen to help Guild Park. To learn more, email us at guildparknews@gmail.com. In July, Friends of Guild Park had a booth at the Guild Alive with Culture event where we engaged folks in a discussion about what is, and what could be, at the Guild Park. This was a lot of fun and the folks who dropped by our booth created a collaborative piece of art. The result was a hand-made tapestry that’s a wonderful visual representation of possibilities for the park. We identified four main ideas for Guild Park’s future, represented each with a colour, then asked people to pick whichever idea resonated with them and weave the corresponding colour into our piece. Councillor Paul Ainslie was among those who got in on the fun. His choice? A green piece of fabric -- representing the idea of a new library in the park – that he wove into the artwork. The Guild Alive festival at Guild Park was a big success. It’s organized annually by Councillor Ainslie and the Guild Renaissance Group. This year, thousands of people came to visit with artists and artisans, watch the performances at the Greek Theatre, enjoy the BBQ by the Old Stone Cottage Pub and meet with community groups. Friends of Guild Park & Gardens is a finalist for a prestigious Heritage Toronto Awards. We are among five volunteer groups in the city in the running this year for the Community Heritage Award. 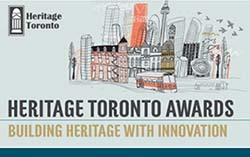 This category recognizes community-based organizations that actively promote, protect or preserve Toronto’s historic/natural assets and work to engage and educate the public on heritage issues. This recognition comes in the very first year of operations for our organization. It also marks the second consecutive year the Guild Park is part the Heritage Toronto awards. A volunteer-produced video advocating the revitalization of the Guild Inn earned Heritage Toronto’s honourable mention award in 2012. This years’ award ceremony is Tues. Oct. 14 at Koerner Hall at the Royal Conservatory of Music. Coincidentally, the surviving keystone from Toronto’s original Royal Conservatory of Music is preserved and displayed at Guild Park. Celebrating Guild Park & Gardens. 2:00 – 4: 00 pm. Cedar Ridge Community Centre, 225 Confederation Dr., Scarborough. Save this date for a special afternoon reception. It marks the first six months of Friends of Guild Park & Gardens. Show your support for Guild Park by coming out to this fundraising event and enjoy an entertaining and informative afternoon. Guest is Jane Fairburn, author of Along The Shore, her best-selling book about Toronto’s waterfront. Jane will talk about the legacy of Rosa and Spencer Clark, founders of the Guild Of All Arts, and about Guild Park’s significance to Toronto waterfront. Also learn what’s in store for Guild Park. Special reduced prices for members of Friends of Guild Park. Watch for more information. How can you get involved?? Thank you for asking!! Ideas, volunteers, sponsors and performers are all invited to help at our upcoming events. If you’d like to lend a hand, contact us at guildparknews@gmail.com. We’re looking for volunteer bakers for our Halloween Bake-Sale table on Sat. Oct. 26. Have a ghoulishly good treat that you can cook up and donate for our event? Contact Tracey by email at guildparknews@gmail.com. Want to see an expanded community library located at Guild Park? Email Councillor Paul Ainslie at councillor_ainslie@toronto.ca. Please include a short comment of support. Councillor Ainslie has already started the process. Sending your comments will help him move forward on this idea by showing public support to his colleagues at Toronto City Hall. Thanks to all our members and supporters for your patience. It’s taken us a little longer than we expected to get our first newsletter to you. Now it’s your turn to talk to us! Let us know what’s on your mind about revitalizing Guild Park. We’d love to get your ideas, comments and especially hear how you can help us turn all these ideas into action by getting yourself involved. Just contact us at guildparknews@gmail.com.